When you visit your grandmother, you expect to smell the usual leather of her couch, you expect to get lots of chocolates, and expect to hear about the stories she always tells (well that were at least my associations). In a situation like this one, you have associated food, smell, and conversation content to each other in your mind. You don’t expect to experience something else. In our daily lives we have many things associated with one another. What I mean with association, is the phenomenon when two (in)dependent systems show coherent patterns and therefore merge together in your mind. For example, you see, hear, smell, and feel sensations during this very moment. The shape of an apple is strongly connected to the taste of it. Making these associations make it easier for you to interpret the situation, and the things you would expect. I believe there is a certain rhythm, a frequency in these perceptions over every sense (level). For perception, the frequency of your sight has a strong connection with the frequency of your hearing. You want that your brain processes the signals in such a way, that once you see someone knocking, you hear their knock at the same time. In that way you can associate these signals to each other and merge them. The sight of the knock and the sound of it have become one thing in your mind. However, associated systems in your mind are not always necessarily dependent on each other. This is the case with classical conditioning (like Pavlov’s dog) and with many illusions. In these situations, these signals are just two independent signals going with the same pace, and evoke associations. In this blog I will talk about the advantages of associations and dissociation. Furthermore, I will talk about actual coupling of systems. Associating signals makes you view these signals together as one. You associate them with each other. As mentioned, when signals are associated it costs less effort, increasing your ability to make quick decisions and fast actions. Even though they could be quite a bit generalizing. Association examples are the perception that fireworks belongs to New Years Eve, that you always wear shoes when going outside, or that you always say “good day” at the end of a conversation. If something happens without the other, it feels weird. Furthermore, you have activities associated to places, places to emotions, and activities to emotions. Just think of your associations when frowning your eyebrows, you feel anger don’t you? But why? Frowning your eyebrows is just a physical activity, it has nothing to do with anger. Associating systems saves you a lot of effort and makes it easier to fit in with society. People like it when their behavior can be associated with other behavior. Have you felt the despise when you hear someone talking about vegetarianism? I believe, this despise arises because these people have always associated eating dinner with eating meat, and haven’t differentiated them. Suddenly, there is a strange vegetarian who does not associate dinner with meat. That seems weird for the one who has always put them together in one category. Dancing in public is weird, not many people associate the public space with a good dance. So people might despise this behavior by saying “it just doesn’t belong in the public space” even though they have no right reason for it. Furthermore, for an experiment I wore a winter only a T-shirt when going outside, and I spoke to so many people who didn’t like what I was doing even though they had no solid arguments (read more). Usually, people associate being outside in the cold with wearing a jacket, and seeing something different is weird. I believe, weird behavior indicates dissociation of systems what gives uncertainty for the one who has the systems fully associated. Suddenly, they realize that things could have been different all along, making them feel stupid. The behavior on itself might not be that important but the act of dissociating by itself might be the important thing that annoys the ones who have the systems associated. That said, there are some advantages of dissociation. Dissociating connected things gives you more opportunity for variation because you have more options. I believe many innovative ideas come from here. Furthermore, I believe that people who are good liars can better disassociate the mind from the body. They can use their body to express innocence while they are thinking different things at the same time. Monks, and professional fighters might have the same qualities. Through dissociation you can view these systems apart from each other. Men might be better with dissociating the female body from her mind, while most women take the mind and body together as one. Taking systems apart might increase the capability for more analytical behavior, but rises the chances of social unwanted behavior, which goes in hand with symptoms of autism. And we also know that autism costs a lot of effort. Next to association, we have the actual coupling of systems. Coupling happens when systems’ behavior are actual dependent on each other. One good example of coupled systems would be the the mind and the body. For example, once your mind wants to move, the body should always move. And when your body moves, your mind should be aware of it. So, for a normal healthy person, the mind and body are usually coupled, and this is usually more healthy. So as a result, we associate the mind and the body with each other. However, it is not necessarily the case that they are. 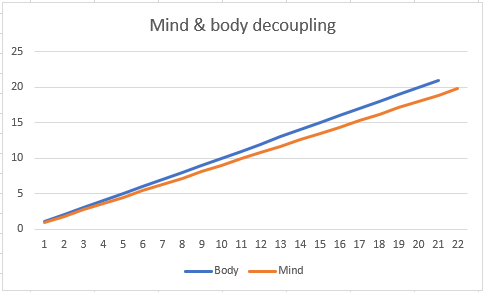 Imagine that the mind and the body decouple. Imagine that they lose connection, like with sleep paralyses of sleep walking. Now, the body and the mind’s rhythm continue with their own individual pace. Imagine that the body’s rhythm goes with its usual pace, a pace of; 1,1,1,1,1. But suddenly, the mind starts to update in a different frequency loosen its connection from the body. For this example, the mind is going with a pace of 0.9, 0.9, 0.9, 0.9. At first, the signals seem close to each other, like shown in the figure on the right, but over time they start to deviate from each other. In this case, the mind and the body have different rhythms. But in the start, you still associate the body and the mind with each other, so you feel there is something wrong. Your mind and body do distorted things. However, if you still associate them together, so if you take the sum of the two sequences together, you get both sequences in one rhythm (the second figure). You view the mind and body as one entity, but they show a distorted rhythm over time, showing irregular behavior. So you should change your view and disassociate them from each other to find the structure (like in the first graph). But this requires you to independently control both systems consciously, costing a lot of effort. But don’t worry. Coupling or uncoupling is often not that black or white. Things are often not fully coupled, or fully independent.This is because often there is some interdependency between the systems. The pace of the one system influences the other system, and the other way around. You can read in this blog why this happens, but interdependency makes systems more likely to couple. Thus uncoupling completely is quite unlikely to happen in one system. But also in uncoupled systems, seemingly stupid associations are quite logical after all. Just like with social norms, norms usually exist with a reason, stating the interdependency with the norm and the most rational behavior. The most rational behavior (probably) made the social norms, while the social norms influenced the most rational behavior. Both phenomena influence each other. Just as your mind influences your body, and your body your mind. I believe this blog gave myself a couple of insights on association, dissociation, and coupling. Nonetheless, I don’t know when one should be able to associate or disassociate different systems. It probably depends on the case and your profession. Once you zoom into things you would be more able to disassociate the systems from one another. But associating increases your ability to see integrate components as one, making it more feasible to make quick decisions and to solve complex cases. I believe that the best way to deal with it, is the realization of the phenomena occurring. If you are able to view a process from different levels, recognize your association, and analyze the interdependency, you get a lot of insights. Once the interdependency results in coupling, the parts are aligned and are in a fractal state; self-similarity over different levels. I think this is the most beautiful thing to happen within systems. I will get more into this in this blog.